During the development of an LTE base station, also referred to as evolved NodeB, eNodeB or eNB, a series of different tests are necessary to prove correct operation. After verifying the transmitter and receiver branch, the performance is evaluated, because it needs to comply with the requirements covered in section 8 of the 3GPP technical specification (TS) 36.141. The main focus is on the reception and demodulation capabilities of both physical channels in the uplink, the physical uplink shared channel (PUSCH) and the physical uplink control channel (PUCCH), under various propagation conditions. This also includes different fading profiles and noise levels. 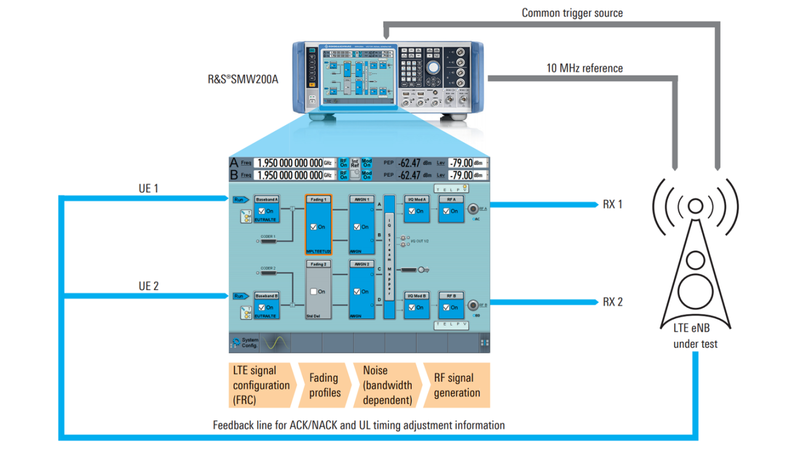 Two challenging test requirements are defined for PUSCH: HARQ feedback and uplink (UL) timing adjustment. The hybrid automatic repeat request (HARQ) makes it possible to correct data packet errors by requesting retransmissions. Correctly received data packets are acknowledged (ACK) by the eNB. Using a non-acknowledgement (NACK), data packets containing errors are requested for retransmission with a different redundancy version. An increased number of redundant bits and/or lower-order modulation are used for less favorable channel conditions. This enhances the probability of correct reception but lowers the available net data rate. 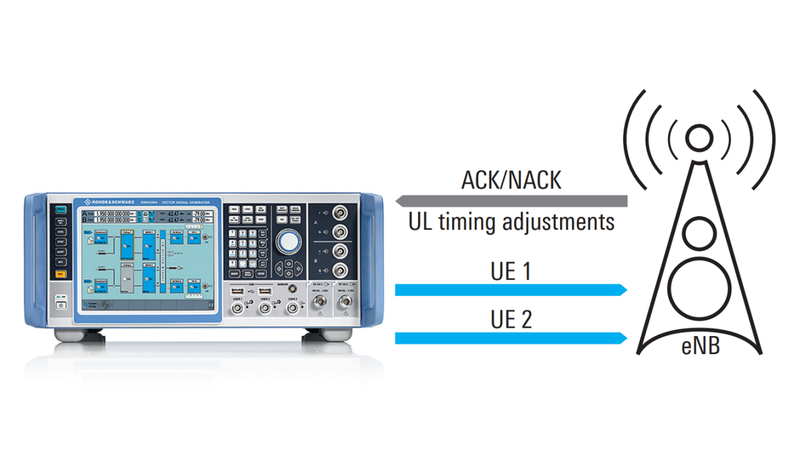 UL timing adjustment enables the eNB to align the transmission signals of different user equipment (UE) in a radio cell to maintain orthogonality. This minimizes interference between consecutive subframes and on adjacent subcarriers, which is particularly important for TD-LTE where an eNB can receive data only during specific subframes. 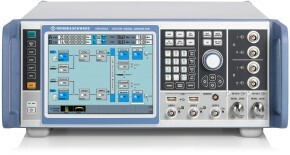 Rohde & Schwarz simplifies eNB performance testing by offering a powerful, convenient and cost-effective one-box solution. The R&S®SMW200A vector signal generator features standard-compliant LTE signal creation. Equipped with additive white Gaussian noise (AWGN) and fading options, various fading profiles and noise levels are available to reliably simulate real-world transmission conditions for UL performance tests on eNBs. Standard-compliant testing of HARQ feedback and UL timing adjustment requires a serial feedback line between the eNB under test and the signal generator. For testing HARQ feedback only, a simple line to transmit binary ACK/NACK information is sufficient. In line with the 3GPP conformance specification, the PUSCH has to achieve specific throughput values at defined signal-to-noise ratios (SNR) and fading profiles. Various test scenarios are specified, including challenging multipath fading propagation profiles along with different predefined signal settings. These fixed reference channels (FRC) determine the modulation scheme, channel coding information and allocated number of resource blocks. Required FRCs and fading profiles are implemented in the R&S®SMW200A. Additionally, the R&S®SMW200A simulates the tasks of the UE, so that the eNB can control the transmission of the channel coded data packets. In case the eNB requests retransmission of a data packet, for example due to difficult transmission conditions, the signal generator automatically uses the next redundancy version or the version encoded in the feedback command of the eNB. 3GPP also specifies that the timing adjustment capabilities of the eNB be tested. The test in line with 3GPP TS36.141, section 8.2.2, requires simulation of two UEs: one stationary UE as reference and one moving UE that is time-adjusted by the eNB. For the channel conditions, two different scenarios are defined. With its two-path concept, the R&S®SMW200A fully supports the timing adjustment test. The moving UE is simulated on one generator path according to the predefined scenario 1 or 2, while the stationary UE is simulated on the second path. Depending on the requested time shifts, the signal generator delays or advances the UL signals of the simulated UEs in realtime. The required throughput is only achieved if the eNB under test sends the correct UL timing commands. These UL timing adjustment tests involve HARQ retransmissions. The ability to simulate real-world LTE signals with fading and to process HARQ feedback and UL timing adjustment commands makes the R&S®SMW200A an ideal and convenient solution for your base station test needs. Setup for testing the UL timing adjustment capabilities of an eNB with the R&S®SMW200A: A two-path concept and the R&S®SMW-K55 and R&S®SMW-K69 software options make the R&S®SMW200A ideal for performing standard-compliant UL tests of eNBs in line with 3GPP TS 36.141, section 8.2.2 – using just one T&M instrument.